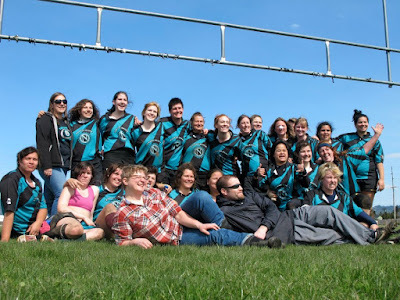 Spring is upon us and with that more incredible Reign Rugby. After an eventful Fall, the Reign is ranked second in the league with the Seattle Mudhens. Come join us for our first practice of the season in Albany on February 3rd. We will get everyone on the same page and go over basics, so tell your friends! Starting February 12th 2018, practice will take place from 6 to 8 on Mondays and every other Wednesday at Bob Keefer Center (formerly Willamalane) in Springfield, OR. The other Wednesday practice will be in Salem starting the 14th of Feb in Salem. Thank you to all the women (that includes you coach) who donated their time, money and skill to make our fall season so great. A special thank you to our sponsors, especially Cascade Peak Performance for providing us a place to work off our holiday padding. Welcome all new & seasoned players to Fall Season 2016! The season is nearly upon us and we are back -- ready to ruck!?!! Here are important dates and events! We are always welcoming new players! us on Facebook.com/EugeneWomensRugby, we would love to hear from you! Wednesday, August 17th, we are all going to show up at 7pm for a team dinner at the West 11th Papa's location! You can bring it in at any time over the course of the day on the 17th! Bring the flyer into Papa’s Pizza on August 17th and our team will receive 50% of the value of the food you purchase! You also have the choice of purchasing Fundraiser Bucks that are good for all future purchases. These Bucks will earn 25% of their value for our rugby club. This event is location specific and beverages/ deliveries do not count toward our fundraiser (unfortunately). Field costs, travel costs, future new kits (socks, jerseys, shorts, etc. ), the Babb Scholarship*, in honor of Lindsay Babb, for players that do not feel that they can afford to play (no one should feel they cannot play due to finances), a 501c3 Non-Profit status, referee costs and many, many more things! Our 6th Annual Garage Sale will be taking place this approaching weekend! We will have a variety of all kinds of things from electronics, clothing, household items, shoes, knick-knacks, etc.! We hope to catch your lovely faces out and about on either Saturday or Sunday between the hours of 9am to 4pm either day! Stay tuned for more updates and a revamp of the current players section this season! Put away the holiday decoration and pull out the cleats because Spring Season is upon us here in Eugene. We have a great number of women ready to get back into action and we would love to have even more. Even if you haven't heard of the sport before anyone one of our fearless ladies can take the time out to walk you through any question you have. Don't be afraid to even check our links page to get a better understanding of this long time sport! Come out and run around with us for a while, give us a try!! 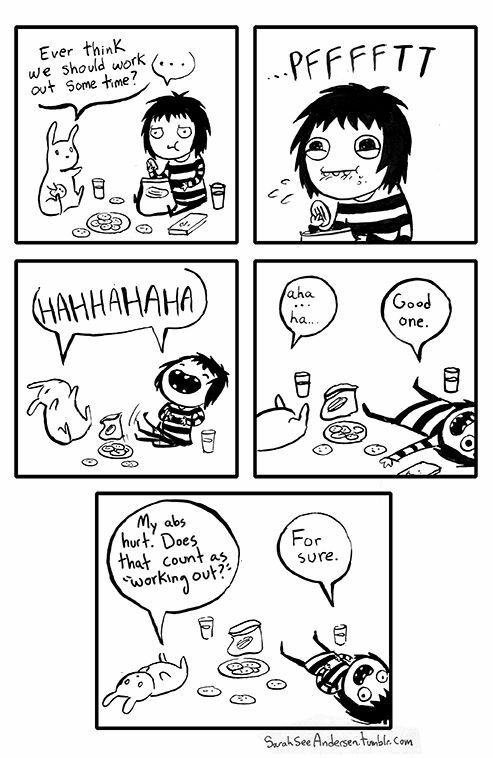 ;) Every body size and shape has a position! Tryouts & Practices start first week of February! No experience necessary! Never played? Been a few years since you've ran around? Not a problem!!!!! We do have a private page that we update with fitness goals, motivation for each other and community service work we do. 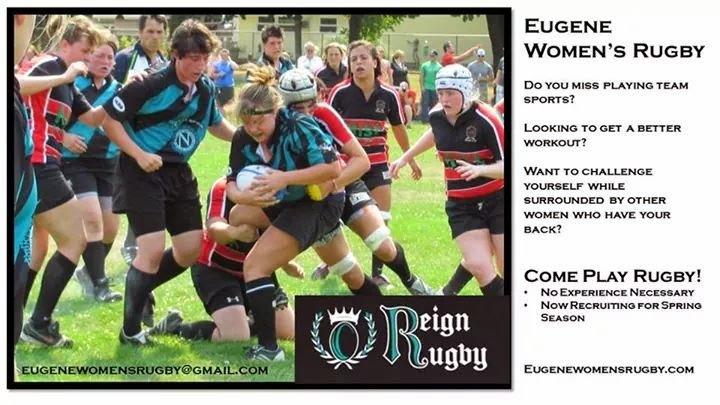 If you would like to join this page please send a request to our Eugene Women Rugby Club page and one of our admins would be more than happy to add you and give you some more info on the team. We are welcoming to all community's with women from all walks of life. If you or some one you know could use a little more empowering lady action in their life send them our way!! !